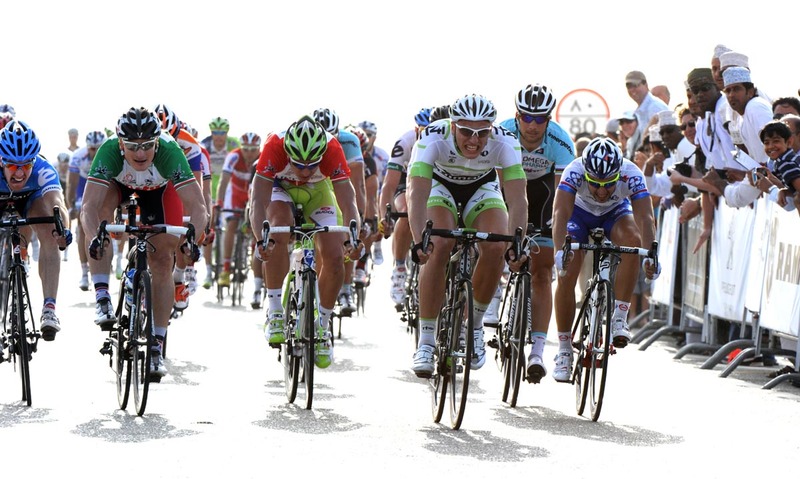 German sprinter Marcel Kittel (Project 1T4i) won the third stage of the 2012 Tour of Oman on Thursday. Andre Greipel (Lotto-Belisol) gave Germany a one-two on the stage, and took back the race lead from stage two victor Peter Sagan (Liquigas). Frenchman Nacer Bouhanni (FDJ-BigMat) continued his strong start to the season with third, both on the stage and overall. A Tour of Oman stage win may not be the most prestigious win of Kittel’s career, but the significance lies in the calibre of sprinters he beat outside Muscat Bank HQ: Andre Greipel, Tyler Farrar, Peter Sagan and Mark Cavendish, beaten for the first time in a sprint he’s contested this year. Into a chaotic final five kilometres, Team Sky led the succesful pursuit of breakaways Kevin Hulsmans (Farnese Vini), Vladimir Isaichev (Katusha), Will Clarke (Champion System) and Alexandre Lemair (Bridgestone Anchor). But when it came to the sprint into a headwind, Kittel went powerfully and Cavendish finished eighth. There were initial recriminations between leadout riders over at Team Sky, as they tried to piece together where it had gone wrong. So, what’s missing? “There’s nothing missing, it’s the first time in the same team together doing a lead-out. Maybe we came from a little far back,” he mused. Cavendish also missed a chance to contest the sprint on the race’s opening day, after being baulked by Alexander Kristoff (Katusha), losing position and speed. Young German Marcel Kittel shot to prominence last year by winning 17 times in his first season as a professional. But as his cycling celebrity rises, Kittel has also had to cope with controversy. Three weeks ago, German TV channel ARD suggested that he might be under investigation for receiving possible blood transfusions as part of an inquiry into German Olympic doctor Andreas Franke. It was quickly clarified, by rider and team, that Kittel was not a suspect in the investigation. “I spoke with a lot of newspapers to make it clear what happened because I have nothing to hide, I hope it’s clear for everyone,” Kittel said. Beating a quality field in Oman is a step up for the German. “I’m really proud of that, to win against the best sprinters in the world… it makes me really confident,” Kittel said. Should Project 1t4i receive a Tour de France wild card – and winning a stage at the ASO-organised Tour of Oman will do their chances no harm – Kittel will be gunning for stage victory and a shot at taking the scalps of the best sprinters when it really matters.